Made from .25-inch thick quality acrylic. This template set includes four nesting swag templates: 6″ x 1” – 6″ x 2.5” – 6″ x 4” – 6″ x 5.5″. It also includes bonus heart and teardrop designs. Use one – two – three or all four swag templates together to create beautiful swag designs for quilt borders. Use the bonus designs between swags or by themselves for alternate border designs. 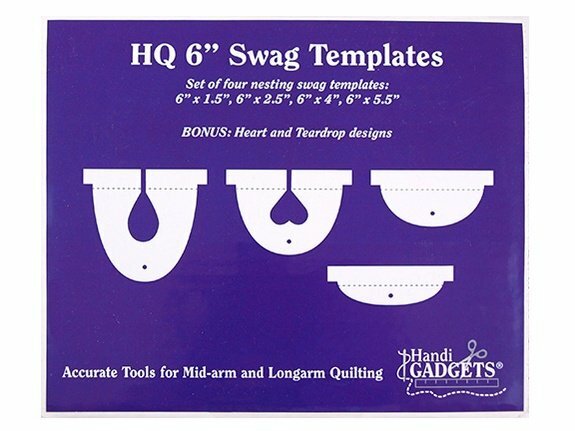 These templates were designed with a slot so they will work for all mid-arm and longarm machines that have a hopping foot. Packaging includes instructions for use safety tips and design ideas. Use with the HQ Ruler Base.